• Adding the new cases each year with existing infection, there are an estimated 110 million total STDs among Americans. People may not know they have an STD because many do not have symptoms, and they can cause serious health consequences if they are not detected and treated appropriately. For example, chlamydia left untreated can put a woman at risk for pelvic inflammatory disease, a condition that can lead to infertility. adults who say “YES” to sexual activity also to say “YES” to getting tested for STDs. STD testing can be confidential and free or low-cost, and common STDs, such as chlamydia or gonorrhea, are usually effectively treated with antibiotics. 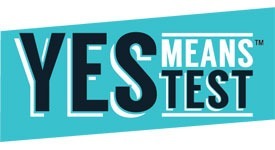 For more information about STDs, “YES Means TEST” or how and where to get tested, visit www.yesmeanstest.org. Join the conversation online with #YESmeansTEST. Say Yes To PrEP: along with condoms, pre-exposure prophylaxis (or PrEP) is an HIV-prevention option for those at higher risk that involves taking a pill once daily. Visit #SayYesToPrEP to find out if PrEP is right for you and search for clinics in your area.